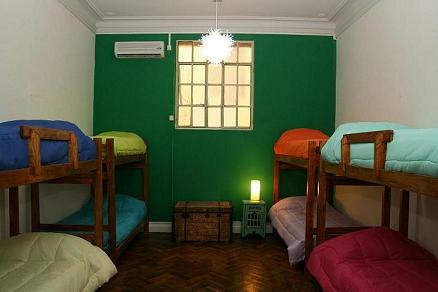 Rayuela Hostel is situated in the heart of Buenos Aires Town culture. The accommodation provides rooms ranging from 2 bedded to 8 bedded. Spacious and comfortable common room equiped with satellite TV, DVD, FREE pool and ping-pong table. tea/coffee making facilities, and central heating. Ac/Air in every room and common areas. Hot water 24-hours a day. The hostel allows guests to leave their baggage at the reception for late departures. The reception is open 24 hrs, Personalized and friendly attendance by the very owners to make your stay unforgettable. FREE BREAKFAST included. Communal kitchen. Security lockers for each guest. TV in private rooms. Free internet and wi fi. We welcome you to a house you will feel as yours, a hostel run by its owners. Youre going to have fun with music and drinks in our game and video room. Cordiality, security, cleanliness and fun are our most important values. Our goal is to get you back. Well be always close for you to know Buenos Aires, to play Buenos Aires, to make an unforgettable experience of it!! The accommodation provides rooms ranging from 2 bedded to 8 bedded. Spacious and comfortable common room equiped with satellite TV, DVD, FREE pool and ping-pong table. tea/coffee making facilities, and central heating. Ac/Air in every room and common areas. Hot water 24-hours a day. The hostel allows guests to leave their baggage at the reception for late departures. The reception is open 24 hrs, Personalized and friendly attendance by the very owners to make your stay unforgettable. FREE BREAKFAST included. Communal kitchen. Security lockers for each guest. TV in private rooms. Free internet and wi fi. Ac/Air in every room. TV sattelital in private room. FrigLinen and blankets included. Comfortable and high quality mattres. Individual safety lockers. The hostel is located just in front of the Belgrano subway station of the “E” line and just 1 minute walk from lines A, C, D. and the Republic Park, with its Metropolitan Cathedral and the Cabildo monument. Situated a few blocks away from the heart of San Telmo district. 5 minutes walk from the Obelisco, Puerto Madero and Corrientes Av. From the airport a Taxi must be taken. From Retiro bus station, C line of subway leave you 1 block away from Rayuela Hostel. 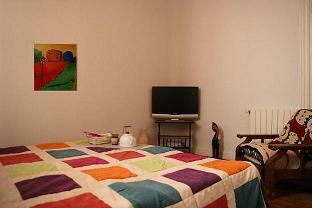 Rayuela Hostel is situated in the heart of Buenos Aires culture district. The best place to Know and live Buenos Aires. 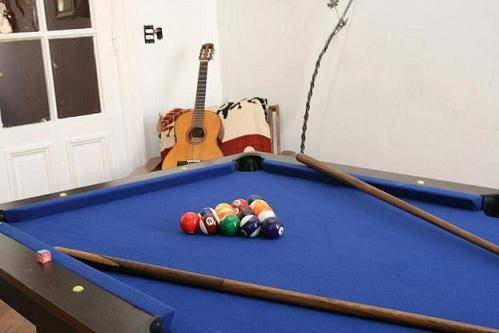 The hostel is located just in front of the Belgrano subway station of the E line and just 1 minute walk from lines A, C, D. and the Republic Park, with its Metropolitan Cathedral and the Cabildo monument. Situated a few blocks away from the heart of San Telmo district. 5 minutes walk from the Obelisco, Puerto Madero and Corrientes Av. From the airport a Taxi must be taken. From Retiro bus station, C line of subway leave you 1 block away from Rayuela Hostel.